Advertising space is available in the 'Huntingdon' magazine, get in touch for more information! Are you receiving your copy of Huntingdon Magazine? If not please get in touch. Please be aware - Huntingdon Town Council will never contact you to request any payment over the phone. 217,039 page views over twelve months, updated daily. Applications for interment are usually submitted by undertakers but enquiries, including the purchase of Exclusive Rights of Burial, may be made directly to the Town Clerk's Office (Kate Yerbury) on 410381. This Cemetery was first established in the 1850s and was originally laid out by Robert Hutchinson, a well known Architect at the time. It is dominated by a Victorian Chapel, which is still available for use in connection with local internments. This Cemetery is both the old 'traditional' type, which contains memorials of all shapes, sizes and conditions. There is also an area set aside for 'lawn' burials, where the memorials comprise soley of a headstone. There are no burial plots available at this time. This Cemetery is a Lawn Cemetery, which was established in November 1982 and allows only for memorial of the simple headstone type. There is an area for interment of cremated remains in respect of which memorial tablets may either be set flush with the ground or mounted on a memorial wall. There is also a children's section in this Cemetery (for up to age 12), where a little more flexibility is allowed in the type of memorial erected. This Cemetery was opened in January 1997 and is also a Lawn Cemetery where only headstone memorials are permitted. Huntingdon Town Council is responsible for maintenance of closed churchyards. 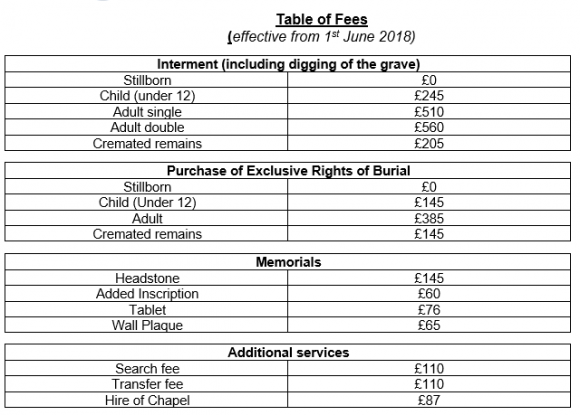 Details of fees for our cemeteries services can be found below. STILLBIRTHS – if mother is Huntingdon resident or ex Huntingdon resident out of the area for less than 5 years – No charge. If non resident then £55 Interment fee applies. No burials may be scheduled on a Tuesday following a bank holiday. Please complete this form if you are looking for more information on our cemeteries. Please give some detail of the information you are looking for. Today is Huntingdonshire Day! In honour of Oliver Cromwell's birthday we are flying the flag of Huntingdonshire from the Town Hall today. Oliver Cromwell was born on the 25th April 1599. RT @CambsCC: We all want to make sure every child goes on to lead a healthy life. Make sure your child is vaccinated – it’s safe, effective and available free of charge from your local GP surgery. HTML5 validated. WCAG compliant. Page generated in 0.1499 seconds.